All Lives are Precious, No One Born by Choice ! Radha Paudel Foundation proudly presents ‘Khalangama Hamala’ by Ms. Radha Paudel. Released 2013 it received Nepal’s premier literary prize Madan Purashkar. We are happy to announce that the English edition being titled “Jumla – A Nurse’s Story” is available now! The book is written about the concerns and challenges of Karnali and life during the Nepalese civil war/maoist insurgency in Nepal with special focus on 14th November 2002. Ms. Paudel survived 13 horrific hours of cross fire and the peak years of insurgency in Nepal in one of the poorest and most rural areas called Karnali. 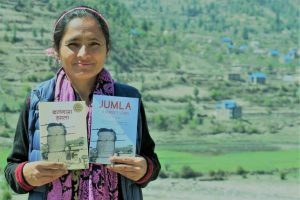 Ms. Paudel has already committed 10% of the royalties from this book for the peace commemorative memorial center (Miteri Shanti Batika) in Jumla to honor and remember the 247 people who died during insurgency in Nepal. The peace commemorative memorials is $60,000 to construct and is a three story building which include a garden, meditation hall, café, rest room, e-library and resource center, sports and memorial statue all centered around peace. Friends from the USA and UK, relatives and friends of the deceased and Ms. Paudel have already contributed but there is still a long way to go to fully fund this dream. So by purchasing and reading this book you invest in peace.